You probably have seen people around the gym wearing a bright colored piece of fabric on their knee. You may have wondered what it was and why they were wearing it. Most likely, it was a neoprene knee sleeve. What is a Neoprene Knee Sleeve and How Does It Work? 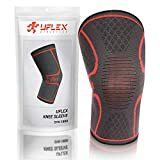 Where Can You Find a Neoprene Knee Sleeve? Neoprene is a synthetic polymer resembling rubber. It’s resistant to oil, heat, and weathering. 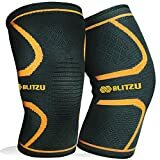 It’s the perfect material for a knee sleeve because it’s flexible yet durable. It will heat the muscles in the knees without causing sweat and bacteria. There’s a difference between a knee sleeve and a knee brace. A knee sleeve is used to prevent injuries like torn ACLs, PCLs, MCLs, or any bone damage. 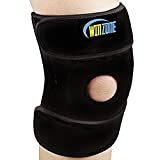 A knee brace is to help after injuries occur. They prevent any more damage from happening while the injury heals. 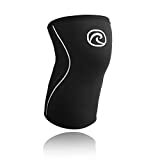 A knee sleeve provides support when the knees are under a lot of pressure. They also have a compression element that increases blood flow and reduces pain during and after a workout. The compression is important because better blood flow means that it will be a quicker and better recovery. There will also be less pain and swelling. They are usually made of neoprene and slide over the knee. It will help stabilize you because it keeps all the bones and muscles in place. This minimizes the chance of dislocation. Anyone who does physical activities that puts stress on their knees should wear one. For example, if you are a weight lifter and your knees are the lift source, you need one. This is because the pressure from the weights can actually cause your bones to grind together. Not too pleasant sounding, is it? Runners also use it to prevent runner’s knee, which is actually called Patellofemoral Pain Syndrome (PFPS). But, that’s a mouthful. This injury comes from the constant impact of hitting pavement while running. It can include pain in the knee and swelling. People who do CrossFit can benefit from knee sleeves as well. It’s flexible enough to handle different types of positions while still keeping you safe. You can find these almost anywhere. You can get them at places like Walmart, Walgreens, any sporting goods store, and Amazon. We went on Amazon and found some of the best neoprene knee sleeves around. 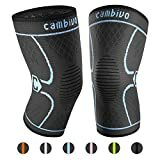 Because knee sleeves are something that you won’t know if you like or not before buying, we figured we would look at the reviews. This is a single sleeve. It comes with silicone, so it doesn’t slip down during your workout. They advertise as being able to handle any sports at any level. It has gradual compression, meaning the squeeze is spread out. It has a 4.7-star rating and over 9,000 reviews. Pros are the price, the accurate sizing, and the good compression. Cons are that some people said the silicone cuff stopped working pretty quickly. Also, some people had theirs tear in a week or less. These sleeves are designed to reduce swelling and inflammation. It has a reinforced patella stabilizer that holds the patella in the proper position. It gives a gentle compression for a massage effect and retains heat to improve muscle health. The fabric is durable, flexible, and breathable. It also has moisture wicking capability as well. It has a 4.7-star rating and over 1,000 reviews. Positives of them are how comfortable they are, how durable they are, and how much pain relief they give. Negatives are that they tend to roll and there have been complaints of them bunching behind the knee. People have also said there is not enough support for more intense activities. This is a single sleeve and this brand seems to be popular in the fitness world. It can handle heavy-duty activities like weightlifting and still give support. It provides knee joint compression. It helps relieve pressure and improves balance. This knee sleeve actually has a patented anatomical design because it’s so different than the others in the market. It has a 4.6-star rating and over 1,000 reviews. People love it for the support it gives, how it doesn’t move no matter what you do in them, and that they are cushioned. People did not like the sizing chart. Many people ended up ordering a size smaller than was suggested. They also don’t like that for $40, you'll only get one sleeve. People have complained that it retains heat too well, leading to a lot of sweat. These sleeves will work well for both men and women. They advertise that they are good for weight lifting, cross training, powerlifting, and other heavy workouts. They have a 4.5-star rating and over 2,000 reviews. People love these sleeves for the fact that they come in a pair, they give good support, and the company’s good customer service. Some people have complained that they made their knees sweat too much. There also seem to be some issues with the sizing. Many people ended up having to return theirs because they were too big. This is a pair of knee sleeves that come in 4 different colors. Depending on what you pick, the price may change. These sleeves are anatomically shaped to prevent injuries and ensure comfort. They have silicone in them so that they don’t slip down. The elastic in them gives constant compression without being painful. The company says these sleeves can handle anything. They have a 4.5-star rating with over 1,000 reviews. People like these sleeves because they are very comfortable to wear, affordable, and provides enough support. There have been complaints that they slid down a lot, which can get uncomfortable quickly. You can buy these knee sleeves from this listing as a single sleeve, a pair, or 2 pairs. Depending on what you choose, the price will change. It’s designed with a 4-way stretch Lyrica, making it more flexible and durable than most neoprene knee sleeves. It’s also lightweight. You can wear it all day and even under your pants and still feel comfortable. It moves with you, so there is no chafing involved. It has a 4.5-star rating and over 500 reviews. Highlights are how heavy duty it is yet lightweight at the same time, and the amount of support it gives. A lowlight is that it seems to run smaller than the size chart provided says. Many people who ordered a small, ended up buying a medium instead. These sleeves come in 3 different colors. Depending on what you choose and the size, the price will vary. It has a double lined anti-slip silicone so that it doesn’t slip and offers more support than the average knee sleeve. It also offers a gentle compression to help with blood flow. It has a 4.5-star rating and has almost 700 reviews. Pros are that it helps with knee pain, its fabric doesn’t irritate the skin, and it’s supportive. People also praised the customer service. Whenever someone had an issue, the company contacted them and sent them a replacement. The replacement was always better. The biggest con is that many people said that the sleeves didn’t last long. After a few days, reviewers noticed the sleeve would slide down and bunch at the knee. 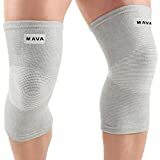 Mava Sports Knee Support Sleeve for Sport, Patellar Stabilizer. Mava is back on the list with another set of sleeves. These also come in 4 different styles and the price will change depending on which one you pick. 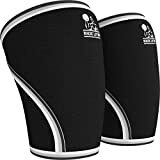 They have a good knee support with no stiffness or itching. There is also no slipping, thanks to being anatomically shaped. They have a 4.4-star rating with over 2,000 reviews. Perks are that they don’t sweat, they feel good to wear, and the price for getting 2 of them is reasonable. There are some claims that they roll down and dig into the back of your knees. Some people also felt that the fabric was too thick, so there was less room to bend your knees. 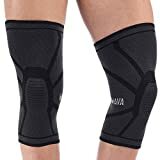 As of writing this, these knee sleeves are the #1 best seller in knee braces. As a reminder, knee braces are different than knee sleeves. These appear to be more of a sleeve than a brace. Maybe the company wanted to cover all ground so it listed everything it could be. These sleeves will work for any sport of any intensity. 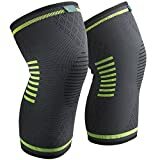 They fit tightly around the knee and give some compression. The fabric is breathable and flexible. It also helps distribute pressure so the knee doesn’t get injured. It has a 4.4-star rating and over 600 reviews. People like it for the material and craftsmanship, the support it gives without being bulky, and how it’s comfortable to wear. People have also commended this company’s customer service. There are people who feel that the compression is too light and the material is too thin. There have also been complaints that the sleeve bunches up behind the knee. People had to constantly readjust it during the day. This sleeve is a little different because it comes with adjustable straps. The straps offer firmer support but at the same time makes it accessible to more people. It has an open patella hole. It also prevents slips. This sleeve has a 4.3-star rating with over 2,000 reviews. They are popular because of the extra support the straps give. Many people with knee injuries are using it to live a normal life. Complaints have been that the Velcro isn’t good. For many, it fell apart rather quickly. Some people also found it uncomfortable to wear for long periods of time. These knee sleeves are sold in 4 ways. Three of the four uses neoprene including the Neoprene Closed Patella, Neoprene Open Patella, and Neoprene with a Gel Insert. Depending on what you want, the price will change. The gel will help with impact absorption. It’s sewn with an exclusive 5 needle stitch and is anatomically designed. It has a 4.2-star rating with over 1,000 reviews. Highlights include it being good at trapping heat, its reasonable price, and its popular among runners. Lowlights are that some people had to adjust them a lot, which can get frustrating. Some people have also said this sleeve is good for moderate activity but not good for intense ones. We think that a neoprene knee sleeve can do a lot of good. The neoprene makes it flexible and comfortable to wear. It moves with your body allowing you to perform with all your energy. For some people, the material may seem too thick. There are cloth knee sleeves but they don’t give the same kind of support. These sleeves would be good for someone who does light activity or has mild pain. Overall, a neoprene knee sleeve isn’t all that expensive to buy. As you can see from the ones that we listed, the range can be from pretty cheap to expensive. We think you need to decide what you want from it for before you purchase it. Do you need it for heavy duty weight lifting? Then, you probably want to splurge on a knee sleeve that has more support and protection. Are you recovering from a knee surgery? A lighter one might be better because there is less pressure on the knee. As with anything you buy on the internet, make sure to read the reviews. There’s no point in buying something if it isn’t going to work.